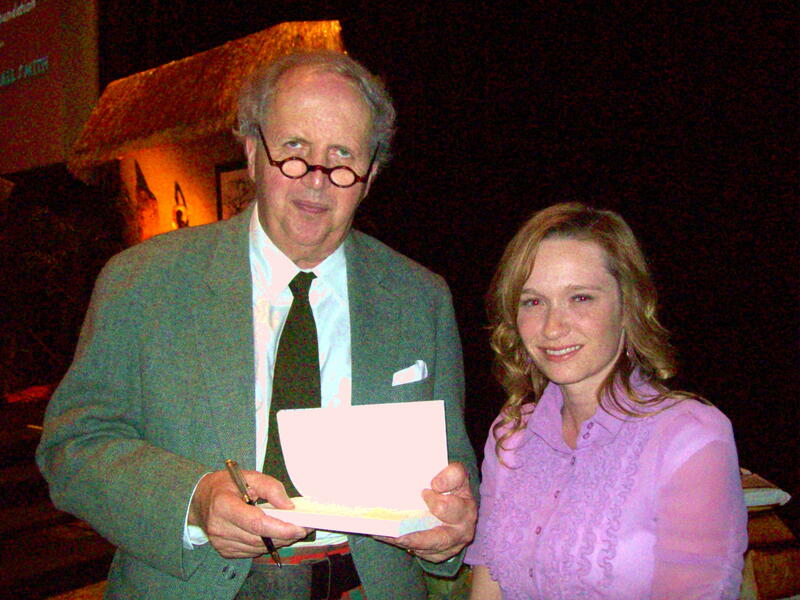 Meeting One of My Favorite Authors: Alexander McCall Smith – The Bookshelf of Emily J. The only thing I asked Alexander McCall Smith when I met him was: “Is the book by Clovis Andersen, The Principles of Private Detection, a real book?” If you’re familiar with the No. 1 Ladies Detective Agency, then you know exactly what I’m talking about. It’s the book Mma Ramotswe uses to guide all of her detective work. She and Mma Makutsi can quote it word for word and often refer to it in the situations they encounter. McCall Smith laughed at my question, and said, “No. I just made the book up!” I smiled, but inside I felt slightly disappointed. I had hoped that there really was a Clovis Andersen who knew everything there was to know about being a private detective. So, imagine my delight when I opened the latest installment in the No. 1 Ladies Detective Agency series, The Limpopo Academy of Private Detection, and out from the pages jumps Clovis Andersen in the flesh. He visits Botswana and spends time with Mma Ramotswe, even helping her to solve a case. He’s a pure gentleman, humbled by the admiration Mma Ramotswe and Mma Makutsi show to him, and embarrassed by their constant quotation of his book. Meeting Clovis Andersen in this novel was like a dream come true for me, a die-hard fan of McCall Smith’s No. 1 Ladies Detective Agency series and the Isabel Dalhousie series. I first learned of McCall Smith’s books when Amy Tan appeared on the Today Show almost a decade ago and chose The No. 1 Ladies Detective Agency as the book club pick. I had never heard of it, but of course I immediately requested a copy from my library and then devoured its pages. The book and subsequent installments were so wonderful that eventually I forced my husband to listen to them on tape in the car with me while we commuted to work together. He began to love dear Mma Ramotswe too, and when we noticed a first season of a television show on Netflix of the novels, we watched that as well. Although the novels are formulaic and tender (opposite of my love for depressing books), I read them whenever they are published. 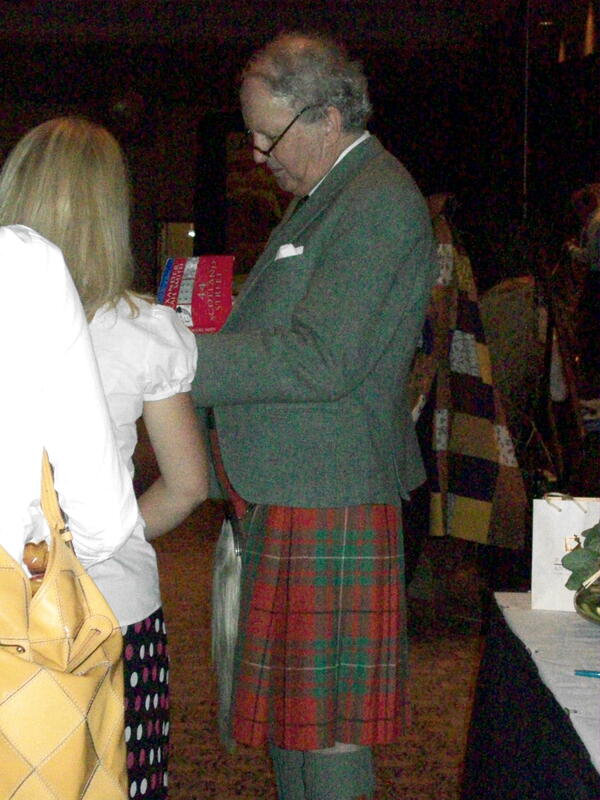 And my admiration for McCall Smith grew exponentially when I got to meet him. He spoke to the crowd with such ease and joviality. His words were laugh-out-loud funny and he stayed for hours afterward to sign everybody’s books in the long line that snaked all the way around the large ballroom. 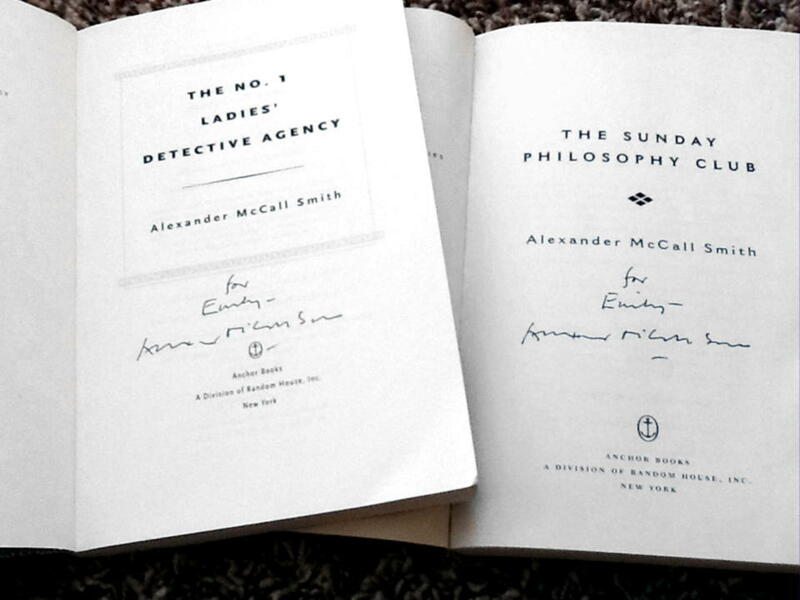 I stood in line for an hour with my books in tow, and when my turn came he signed each one. He also posed for a picture with me and answered my silly question about Clovis Andersen. That moment was nerve wracking for me. I’m shy and easily affected by anxiety, but he handled the encounter with ease. He towered over me, making me even more intimidated, but after the moment had passed I felt happy. It had been worth it. Especially to get my picture taken and to see him in his kilt up close! After that visit, it was fun to read his next book and see that he had included a person whom I work with in the novel. He also included a new pair of shoes for Mma Makutsi modeled on another colleague of mine who had been wearing similar shoes. She told me that he remarked on their unique pattern and had said she shouldn’t be surprised if they appeared in his next book, and they did. The other fun thing about these books is the fact that I knew if I gave one to my step-sister for her birthday that she’d love it. I’m not quite sure of her taste in books, as I am with my other sisters, so when I decided to get her this one I knew it would work because she lived in South Africa and Botswana for 18 months. It was a gift that clicked for me, and I was so excited to give the first book in the series to her. That was at least a decade ago. And I have a vague memory of her telling me that she had gone ahead and read some of the others as well because she had liked it so much. She said that the books perfectly captured the country of Botswana. And, if I have any of this wrong, then she should correct me when she reads this. And even if she hadn’t lived there, I still think she would have liked it. These books are universal. Have you met any of your favorite authors? What books do you like to give as gifts because you know everybody will like them? Well, now I’m dying to know who you work with that was included in these books? I always try to guess when you mention colleagues in your posts…. Apparently, Mike Vause became good friends with McCall Smith and he mentions him in one of his books. I can’t remember which one. The shoes were taken from Gail Yngve (spelling?). She told me she got to interview him and he commented on her shoes and sure enough the next book had Mma Makutsi buying those same shoes for herself. Pingback: Unwanted Reading Recommendations: Borrowing, Returning, and Remembering Books « The Bookshelf of Emily J.
I was delighted to read this post I had previously missed. I also had the pleasure of meeting Alexander McCall Smith at a book reading appearance in his home city of Edinburgh at the Book Festival in 2008. He has long been one of my favourite authors and I am reading all the book series he has written. If you enjoy Isabel Dalhousie, have you read the Scotland Street series? It’s great. He has such a fabulous empathy with women. I did try the Scotland Street series, but just couldn’t get into it. I had a hard time with the fact that it is serialized and therefore not really planned. However, I recently saw that my library has them on tape, and I have a long drive a couple times a week for school, so I thought that I might give them another chance. Thanks for encouraging that. loved this review! I am reading the first book! Thank you! You are just beginning a wonderful treat of a future filled with his work! I first got to know these books at Heathrow Airport. I was browsing in the bookshop before my flight and the first book in the series caught my attention. I think I read half the book in the shop befoer I bought it! LOL. Since then I’ve either bought or borrowed so many more in the series. I’m glad to “meet” another fan. It IS nice to meet another fan. What a fun way for you to find me and to discover McCall Smith. I do love airports because of the time for reading and the people-watching. I found you too by googling Clovis Anderson, The Principals of Private Detection. I love to read books mentioned in books that I am reading, for example a character read a book and was talking or quoting it! I always want to get deeper into books and understand everything there is to know about my favorite characters. I have recently realized in the digital age how we can now talk to authors…I always thought they were untouchable :). I love Mma Ramotswe (sorry if I slaughtered her name), The No 1 Ladies Detective series is a comfort, like macaroni and cheese on a freezing Sunday. I am glad I happened upon it at a garage sale and later not knowing read digital copies! I like how you write your blog, it is polished, professional and something different. I read so many blogs that are hastily put together and I don’t know the word..maybe common, ordinary..no real voice or connection to the writer of the blog, just lots of fandom..? Anyways that was meant as a compliment! I enjoyed this post very much And I look forward to reading more! Aww, I’ve thought of writing authors, but most of my favs are online and some even friends which is so cool for a reading geek like me! Any chance you ascertained how Clovis came to be from Muncie, Indiana? It’s close to my hometown, and not too remarkable. 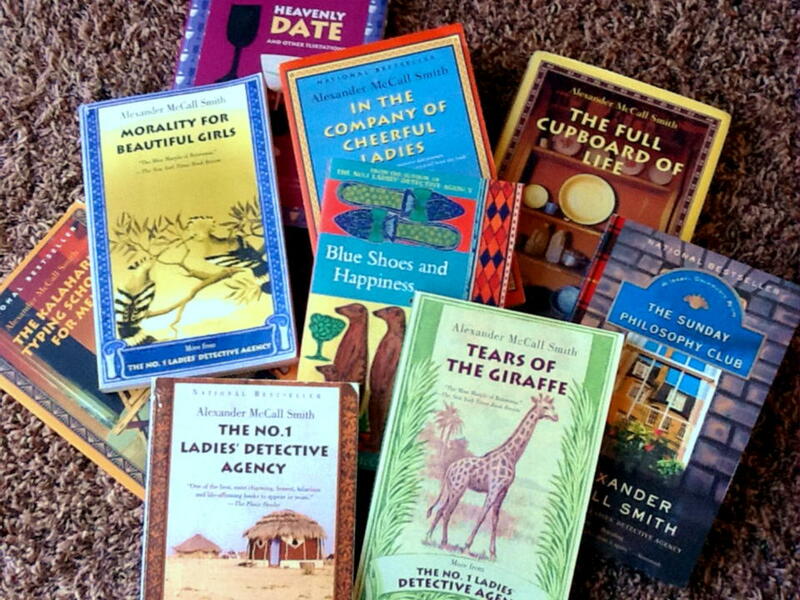 Pingback: Which Alexander McCall Smith Series? | The Bookshelf of Emily J.
Pingback: Little Free Library – The Bookshelf of Emily J.